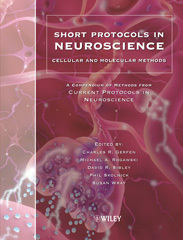 Short Protocols in Neuroscience: Cellular and Molecular Methods is an easy-to-use compendium of cellular and molecular methods from Current Protocols in Neuroscience, part of the acclaimed series that has set the standard for excellence for laboratory manuals. The title provides a portable and streamlined at-the-bench resource, covering methods for analysis of neural cell structure and function, isolation and culture of neural cells, and characterization of neural cell gene expression. 1.2 Immunohistochemical Localization of Proteins in the Nervous System. 1.3 Hybridization Histochemistry of Neural Transcripts. 1.5 Intracellular and Juxtacellular Staining with Biocytin. 2.1 Theory and Application of Fluorescence Microscopy. 2.3 Imaging Nervous System Activity. 2.4 Loading Neurons with Dextran-Conjugated Calcium Indicators in Intact Nervous Tissue. 2.5 Using FM1-43 and Other Derivatives to Investigate Neuronal Function. 2.6 Multidisciplinary Approaches to Characterizing Synaptic Vesicle Proteins. 3. CELLULAR AND DEVELOPMENTAL NEUROSCIENCE.-Wray. 3.1 Culture of Neuroepithelial Stem Cells. 3.2 Differentiation of Embryonic Stem Cells. 3.3 Quantitative Analysis of In Vivo Cell Proliferation. 3.4 Long-Term Culture of Hippocampal Neurons. 3.5 Culture of Substantia Nigra Neurons. 3.6 Isolation and Purification of Primary Rodent Astrocytes. 3.7 Experimental Transplantation in the Embryonic, Neonatal, and Adult Mammalian Brain. 4. GENE CLONING, EXPRESSION, MUTAGENESIS-Sibley. 4.1 PCR Cloning of Neural Gene Products. 4.2 Interaction Trap/Two Hybrid System to Identify Interacting Proteins. 4.3 cDNA Library Construction from Single Cells. 4.4 Overview of Neural Gene Expression. 4.5 Selection of Transfected Mammalian Cells. 4.6 Protein Expression in the Drosophila Schneider 2 Cell System. 4.7 Protein Expression in the Baculovirus System. 4.8 Gene Transfer into Neural Cells in Vitro Using Adenoviral Vectors. 4.9 Gene Transfer into Rat Brain Using Adenoviral Vectors. 4.10 Production of High-Titer Lentivirus Vectors. 4.11 Production of Recombinant Adeno-Associated Viral Vectors and Use In Vitro and In Vivo Administration. 4.12 Alphavirus-Mediated Gene Transfer into Neurons. 4.13 Overview of Gene Delivery into Cells Using HSV-1 Vectors. 4.14 Generation of High-Titer Defective HSV-1 Vectors. 4.15 Gene Delivery Using Helper Virus-Free HSV-1 Amplicon Vectors. 4.16 Overview of Nucleic Acid Arrays. 4.17 Preparation of mRNA for Expression Monitoring. 4.18 Gene Expression Analysis Using cDNA Microarrays. 4.19 Overview of Gene Targeting by Homologous Recombination. 5.1 Analysis of RNA in Northern and Slit-Blot Hybridization. 5.2 RNA Analysis by Nuclease Protection. 5.3 Analysis of mRNA Populations from Single Live and Fixed Cells from the Central Nervous system. 5.5 Production of Antipeptide Antisera. 5.6 Production of Antisera Using Fusion Proteins. 5.8 The Use of Phage Display in Neurobiology. 5.9 Using Phage Display in Neurobiology. 5.10 Detection of Protein Phosphorylation in Tissues and Cells. 5.11 Overview of Membrane Protein Solubilization. 5.15 An Overview on the Generation of BAC Transgenic Mice for Neuroscience Research. 5.16 Modification of Bacterial Artificial Chromosomes (BACs) and Preparation of Intact BAC DNA for Generation of Transgenic Mice. Gerfen, C. R. et al.